Israeli Givati Brigade claimed the discovery of an underground tunnel near a wanted person's house in Ramallah in the West Bank intended to kidnap Israeli soldiers, Israeli media sources said. 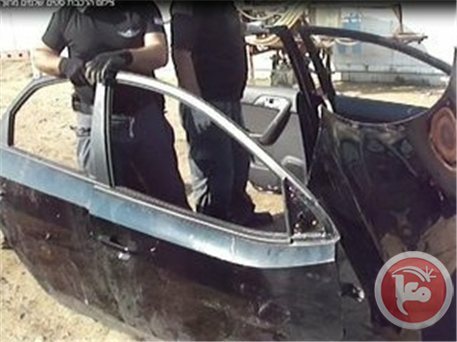 During the course of the arrest of a wanted man in the Ramallah area, the Israeli forces discovered an underground tunnel near his home, in which Palestinian resistance intended to detain a captured Israeli soldier, Yediot Ahronot Hebrew newspaper said. The newspaper stated on Friday that the underground tunnel was part of the Palestinian resistance’s advanced preparations intended to kidnap an Israeli soldier. Shifting to another issue, the Hebrew newspaper pointed out that the Israeli forces have yet to discover the identity of the sniper who killed an Israeli soldier near al-Khalil. "We executed a wave of arrests after the attack, but we still don't have a significant lead," the newspaper quoted an Israeli official as saying. Egyptian border guards on Tuesday afternoon discovered and destroyed six smuggling tunnels under the border with the Gaza Strip, military sources said. They told Ma’an that the operation was a joint activity between border guards and army engineering units. 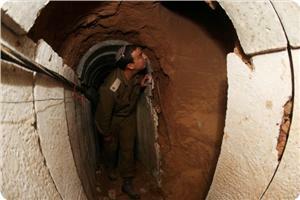 They added that the tunnels were discovered in Rafah on the Egyptian side. A large quantity of goods was seized near the tunnels including more than 1,800 mobile phones and 300 boxes of cigarettes. Separately, Egyptian border guards seized about 700 kilos of cannabis. Palestinian Authority President Mahmoud Abbas will be traveling to Cairo Friday and will meet with Egyptian President Adly Monsour Saturday, officials said. Palestinian Ambassador to Egypt Barakat al-Farra said that Abbas and Monsour will discuss the US-brokered negotiations with Israel and the latest developments in the region. Abbas will also meet with various Arab foreign ministers to discuss the status of the Israeli-Palestinian peace process, al-Farra said. PLO leader Muhammad Shtayyeh said Thursday that Abbas would tell Arab foreign ministers that talks with Israel "are in serious impasse." 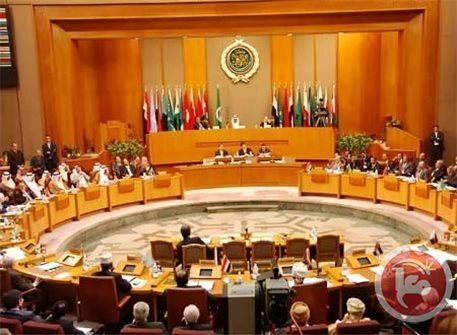 Al-Farra added that Abbas and Monsour would discuss Palestinian national reconciliation with Hamas, an offshoot of the Egyptian-founded Muslim Brotherhood. 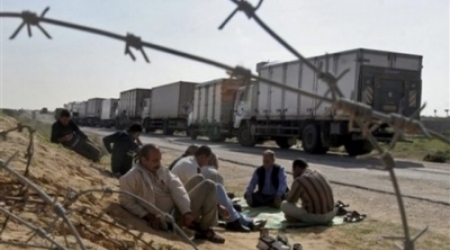 Egypt has severely restricted the Gaza Strip's access to the international world in recent months as it has kept the Rafah crossing between the two countries closed with only sporadic exceptions. Until July of this year, tunnels connecting Gaza to Egypt provided a vital lifeline for the territory amidst the otherwise crippling Israeli blockade on the Palestinian coastal enclave. Throughout Brotherhood member Mohamed Morsi's presidency, the situation had greatly improved, as the tunnels to Egypt witnessed a brisk trade following the Egyptian Revolution. Since the military coup against Morsi in July, however, Egypt has strictly enforced the blockade and targeted the tunnels. Egyptian border guards on Tuesday took over a large tunnel suspected of being used for smuggling cars into Gaza, a military spokesman said. Ahmad Mohammad Ali said that three cars and a motorcycles were seized in the tunnel. It was closed and placed under guard. Meanwhile two people from Gaza were caught trying to illegally enter Egypt from a tunnel in Rafah. The Israeli occupation army declared a state of alert in the vicinity of Gaza Strip to detect tunnels that were flooded during the last storm, after it has deliberately opened dams to flood and destroy Gaza tunnels. Al-Majd security website said on Tuesday that the Israeli intelligence ordered its agents in the areas drenched with water, to search for tunnels damaged by rain water. It pointed out that while everyone was busy with rescuing the stricken areas, the occupation intelligence services have been working secretly on searching for tunnels that extend from the Strip to the 1948 occupied territories. Nearly 80 months after the Israeli regime imposed an all-out land, aerial, and naval blockade on Gaza, the international community continues to remain silent on the illegal siege of the Palestinian enclave, Press TV reported. Gaza has been blockaded since June 2007, a situation that has caused a decline in the standards of living, unprecedented levels of unemployment, and unrelenting poverty. Tel Aviv denies about 1.7 million people in Gaza their basic rights, such as freedom of movement, jobs that pay proper wages, and adequate healthcare and education. The siege has turned the impoverished enclave into the world’s largest open-air prison, threatening the lives of patients and those who are in dire need of medicine and hospital equipment. 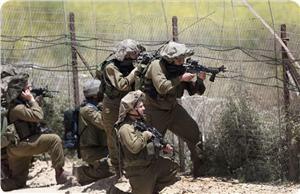 Israel has also launched several wars against the besieged Palestinian strip. Over 160 Palestinians, including women and children, were killed and about 1,200 others were injured in an eight-day Israeli war on the Palestinian territory in November 2012. Moreover, the Gazan predicament has been worsened by frequent attacks launched by the Egyptian army on underground tunnels that serve as a lifeline for Gazans. 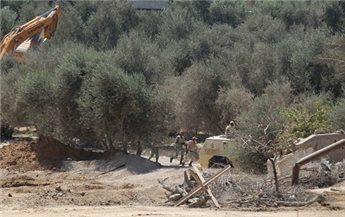 The military has stepped up the destruction of the tunnels on the Egyptian side of the border since July’s ouster of the former Egyptian president, Mohamed Morsi. Several Palestinians have lost their lives as they were caught up in the tunnels during destruction operations. More than 80 percent of the tunnels are no longer functional following their destruction by the Egyptian army.